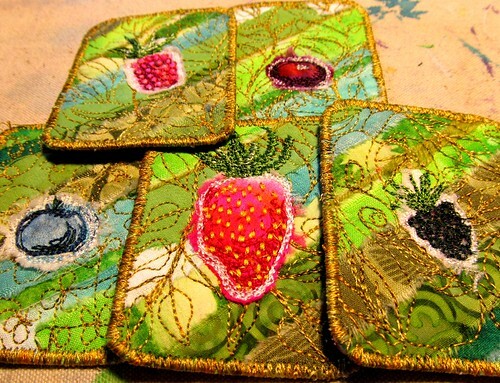 Five berries: hand dyed silk stitched onto patchy and embroidered backgrounds. Four were easy, blueberry, raspberry, blackberry, strawberry. After some thought, cranberry became obvious. I worked for a brief, exciting stint at Ocean spray, where I learned there are 137 different varieties of cranberry. Honestly. Plus, they all fit into a Celestial Seasons Berry Tea tin. Very sweetly. So they are done, and I've posted them to Etsy. I have to finish some Trader Joe's green tea mints before I can start the next one, which will be birch leaves in a tin. And in the real world, today I met a fellow blogger who turns out to live in my town and have very similar interests. Diane kindly talked while I devoured a sandwich, and then I managed to hold up my end of the conversation. We had a nice time, and I hope I've convinced her to come join the fabric women. At the very least, we'll try to get together again.